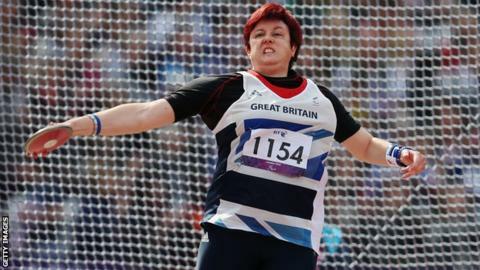 Great Britain's Beverley Jones won her first Paralympics medal with bronze in the F37 discus. The 37-year-old Welsh athlete threw a season's best of 30.04m with her third attempt, before launching out to 30.99 with her final effort. The four-time Paralympian, who has cerebral palsy, competed in sprint events at Sydney 2000 before focusing on the shot put and discus. Kyron Duke, 19, threw a British record 11.24m to finish fifth in the F40 shot. Jones, whose previous best finish at a Games was fourth in the shot put in Athens in 2004, said she was "very emotional" at getting some reward for her efforts. "I am very happy. It was worth the wait to get a medal in the end," she said. "I have worked hard for it in the discus. I had to have faith in myself and keep cool, and I managed to do that with my last throw."